For once, I wanted to make a treat that wasn’t chocolatey and these were a huge success. This is a new and improved version of an old recipe. If you liked them before, wait til you try them now! 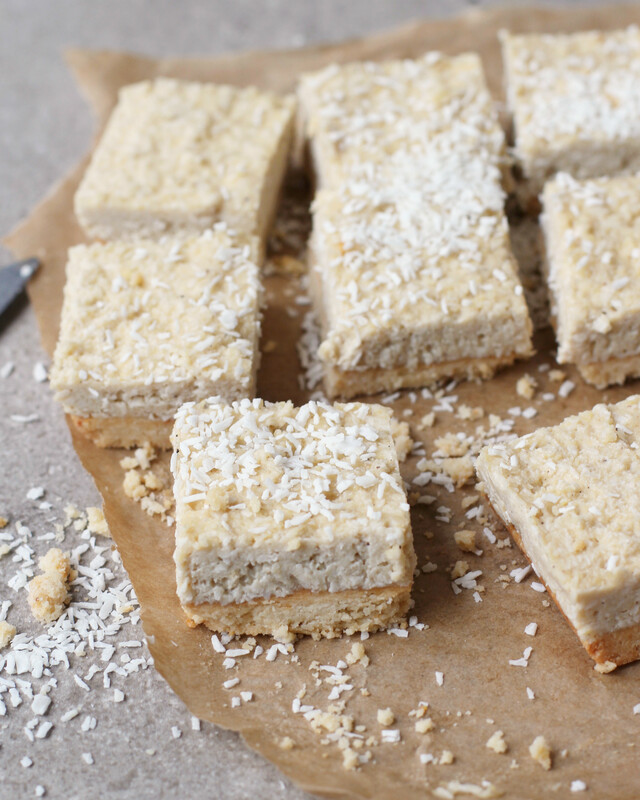 The base is nutty and crumbly with a gorgeous creamy, coconut topping kind of like cheesecake. They keep perfectly in the fridge, tasting just as fresh for about 5 days! Preheat the oven to 180’C. Combine the ground almonds and salt and mix well. Pour in the melted coconut oil and maple syrup and mix well until you have a grainy mixture. Press the mixture very firmly into your baking tin lined with parchment paper. Bake at 180’C for about 12-15 minutes until golden and crisp, then set aside to cool. Drain the cashews and add them to the food processor with the almond milk, 2 tablespoons of maple syrup and the coconut yoghurt. Blend on high until smooth and creamy. Add in the vanilla powder and blend until combined. Taste it for sweetness and add in another tablespoon of sweetener if needed. Add the mixture to a bowl and mix in the desiccated coconut. Spread the mixture out over the base and sprinkle with a little more coconut. Pop in the freezer to set for about an hour and then slice and enjoy! Great idea, that would be delicious! Ohhhhhh going to make these this week!!! Thank you for sharing! OH I’ve got to try these! All my favourite flavours another must make for me! Could you use some other nut instead of cashews? Cashews are the only nuts that go creamy enough. Macadamia nuts work too but cashews are definitely the best! These look gorgeous will try them the weekend. Made the caco balls yesterday they where lovely did not last long. Hi Indy, can you get coconut yogurt in regular supermarkets? I’ve had trouble finding it in the past. Yum! 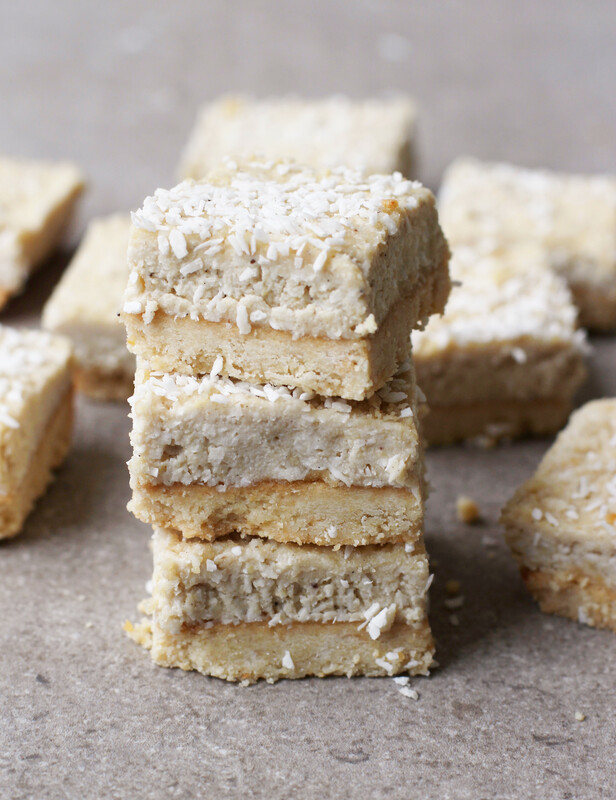 I love all the flavors in this coconut square!